If you had run into Eddy Baker on a sidewalk somewhere, he would strike you as a pretty average guy – pretty good – sized, but no one special. Eddy earned his living as a building materials salesman until he started building swimming pools, which at 76, he still does. That is remarkable, in and of itself; but, that’s not what this is about. When I first attended races at the Phase II Fairmont Speedway [C. J. Richard’s version], one of the first really big stars there was a big guy named Eddy Baker, from Warrensburg, New York. 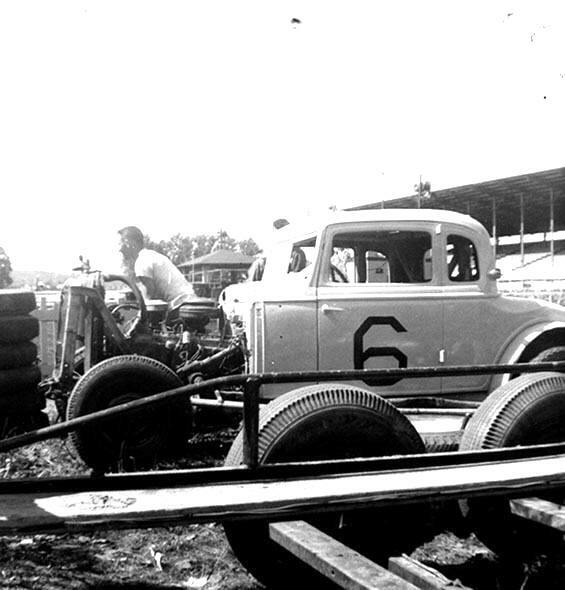 What I didn’t know then was the track had a number of Warrensburg drivers because the Warrensburg track, called Ashland Park, had suffered an untimely demise, three years before, due to a suspicious fire that destroyed the grandstands at the old fairground track there. So, guys like Eddy had nowhere to run. Vern Baker, not a particularly close relative of Eddy’s fusses around the car before the fairgrounds show in 1962. Eddy’s car was sight to behold. A 1932 Hudson coupe, brightly painted yellow with the name 6 PAC on the sides. The car wasn’t much to look at [until Ed’s owner, Verb Baker, decided to re-paint it before the infamous stock car races at the Vermont State fairgrounds in Rutland, around 1962]. The car also didn’t sound like much. It had a characteristic, almost – sputtering noise it made as Eddy plied it around Fairmont’s half – mile oval. He always appeared with the same lucky shirt – a red and white striped golf shirt. But the 6 PAC was fast. As it turns out, the car had history. It had been always owned by Vern Baker, but it had been first driven by Eastern New York legend Wally LaBelle, of Glens Falls. The Hudson had an odd – looking trunk arrangement, partially cut open for some unknown reason. Baker had installed a sliding window as the windshield, similar to the ones the old snack bars used to use to serve outdoor customers. As the windshield got muddy, the driver would just shove it over. 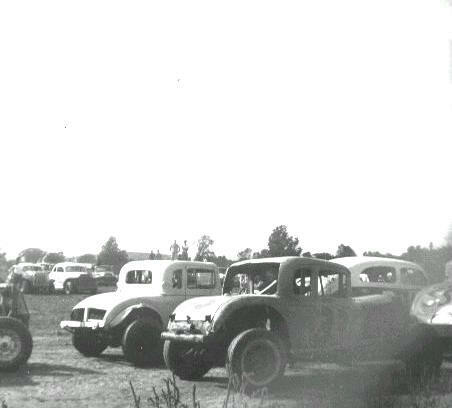 The Vern Baker 6PAC is seen lining up at the old fairgrounds in Warrensburg in the 1950’s. So, the car was famous and proven before Eddy got a chance to drive it – after LaBelle sort of retired. Eddy had been driving a Pontiac coupe for Charlie Wiltze, of Wiltze’s Garage, behind Ashe’s Hotel, right near the Ashland Park racing site. 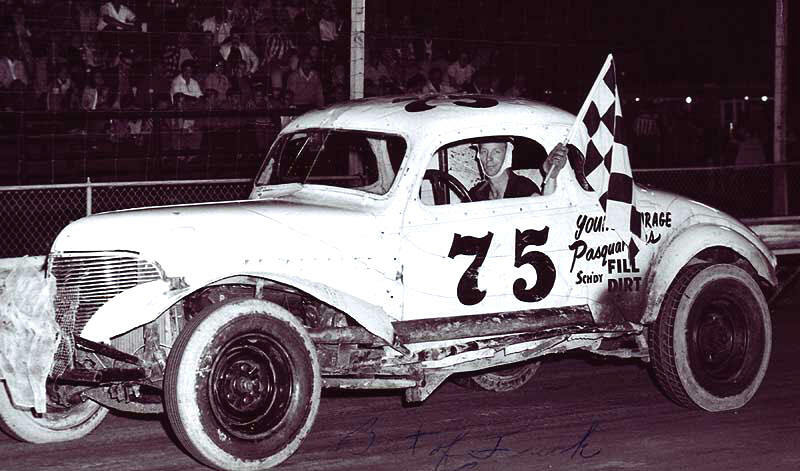 The Pontiac, also numbered 6, was no match for LaBelle and Vern’s Hudson. Eddy quickly earned the nickname “Waltzin” Eddy” because he ended up off the Ashland Park backstretch, over a bank more often than not. One time, the car turned over and a stunned Baker didn’t fully realize it. He immediately reached out and released his seat belt, falling heavily on his head. When he was pulled from the car, he wrenched his ribs and had to put into one of those plastered rib supports of that era. The following day, he back on the road selling building materials. In Rutland, late the next afternoon, a combination of the support and some very hot weather made Eddy so uncomfortable he ended at the Rutland Hospital. A nurse lacking in bedside manner grabbed ahold of the rib cast and yanked it off Eddy – trying to relieve him from the rapidly-forming blisters underneath. Eddy says it reminded him of the Johnny Cash song with the “mud and the blood and the beer” flying in all directions. The air was probably blue in that room. 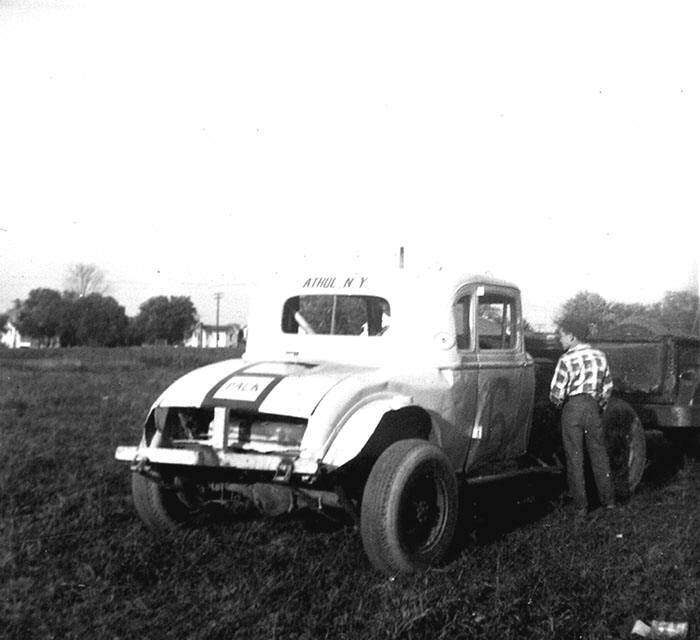 The Baker Hudson, with added fenders and hood, was not much to behold. Eddy is infamous for being the guy who, during a heat at the fairgrounds program, threw a wheel that went out, onto US Route 7. It hit five cars and may have struck a pedestrian. He said a young cop who looked to be about 19 came in and demanded his license and registration. “You gotta be kidding !”, replied an outraged Baker. Eddy and Joe Messina had the only Hudsons there that day, and they finished with Messina’s more powerful car first and Eddy second. He got $225 to Joe’s $500. It was his biggest payoff ever. Later, he would become frustrated with Vern’s micro-management and some corner – cutting to save money. He was less than a lap from victory at Fairmont around 1963 when a jerry-rigged rod that connected to the carburetor bent, and the Hudson motor wound out to the max. Eddy tried to control the car with clutch and any other trick he could think of; but, the distraction cost him three places at the finish. Eddy Baker seems to recall days at the old Otter Creek Speedway with almost more fondness than anywhere else. Small wonder. He related as to how the flathead, local hobby cars would have to run in with the more powerful V-8 NASCAR sportsman coupes because of low car counts. He recall, in particular, one thundering Chevy coupe which I honestly believe was probably the # U2 of local Vergennes Chevy dealer Howie Miller. He says he guy obviously had the wrong gears in the car with his special racing engine. The Chevy would crush him on the straightaways, go into the turns and spin out with alarming regularity. Ed would get him on the turns and let him go by on the straights. 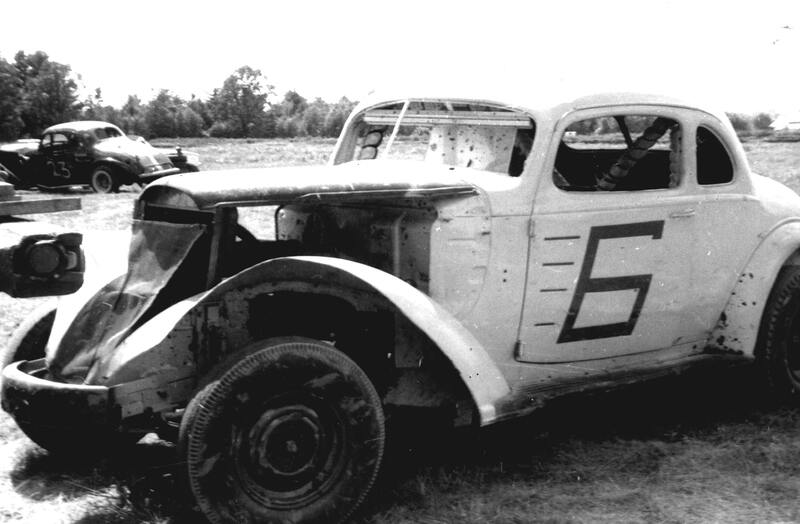 As it turns out, the Baker Hudson, with its little, flathead engine, actually came in first once at Otter Creek, even though the two division shared the track but did not compete for position with one another. From my recollections, the hobby cars did so well there that I didn’t realize they weren’t all running for the same positions. 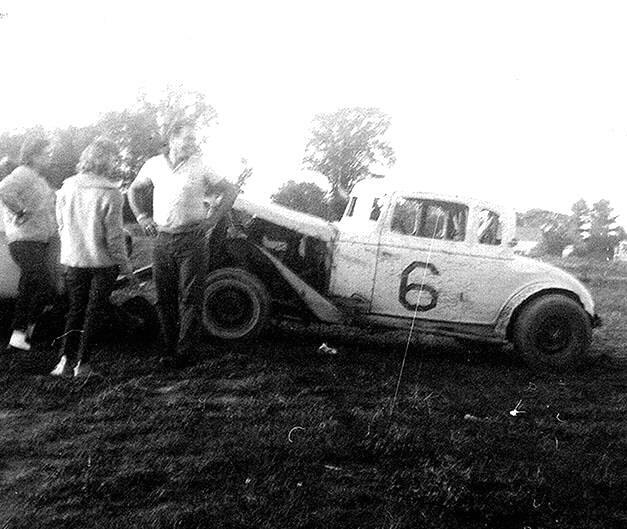 The sportsman cars of such as George Baumgardner, Miller, Jack DuBrul, and the Allie Swears 51 [with whoever was driving at the time] often did not beat out all of the hobby cars. The hobbies had guys like Baker, Vince Quenneville, Sr., and Gene Tetrault. Eddy and Vern’s last try at Hudson glory came when Vern came out with a later – model, 1937 Hudson Terraplane in 1964. At first, Vern tried converting the engine to a crossfire set-up, similar to something Ford had. That was a failure. Vern ended up being given an old Hudson by a lady who wanted it out of her yard. He put the totally – stock engine into the newer 6PAC, and Eddy went out and won his last feature ever. He and Vern had won at least ten features at C.J.’s track, and Vern had won many more with LaBelle. The story of the Eddy Baker, a hero to this writer who was a teen at the time, is a successful one. It was a thrill for me to have him call me recently. The last of the Baker 6 PAC cars, right before it won their final feature.